Justin Thomas and Adam Scott are tied for the lead on 10 under at the Genesis Open but both failed to complete their second rounds in California. After rain delays on Thursday, play concluded on Friday with none of the 144 players able to complete 36 holes. JB Holmes is on nine under while Jordan Spieth did not start his second round, and remains on seven under. American Thomas reached five under for the day after 12 holes, while Australian Scott finished 11 holes. Having started his first round on Friday, the 2013 Masters champions also reached five under for his second round, with five birdies spoiled by a bogey on the par-five 17th. But he told the PGA Tour website that a fresh pair of socks helped him between rounds. "You always feel better with fresh feet," Scott grinned while holding up the wet pair from earlier in the day at his locker. "It's a good veteran move, and it helped me carry over the momentum from the morning." America's Holmes hit a hole-in-one on the par-three sixth for a 63, which was the best score of the opening round. But he is a shot off the lead after two birdies and one bogey through nine holes of his second round. 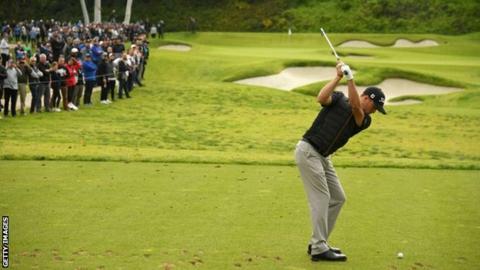 Northern Ireland's Rory McIlroy improved on an opening 72 by hitting four birdies through 12 holes in his second round to move to three under. Tiger Woods is on one under after an opening round of 70 and is level par through 12 holes for his second round, having sunk a 44-foot putt for eagle on the par-five first. Play will resume at 07:00 local time (15:00 GMT).